50% off or more on Extreme RTA Cabinets. Soft close full extension glides standard on most door styles. Free Design Service and instant coupons for additional savings !! Extreme Line: RTA (ready to assemble) cabinets, (no particle board), matching finished interior and exterior. 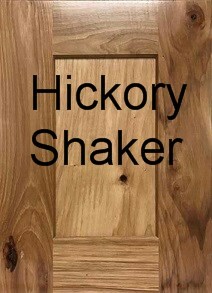 The first 5 doors styles are standard overlay with no soft close. Others are full overlay & come with soft close doors & drawers. Lead time: 10 business days to ship. Extreme Line : Full overlay cabinets do not show the face frame of the cabinet. Standard overlay cabinet or half overlay kitchen cabinet will show a small portion of the cabinet face frame around the door or drawer. Standard Overlay RTA Cabinets are the Heritage White, & Mocha Glaze. The kitchen design may need to be modified slightly when using a full overlay cabinet. With a full overlay door style a small filler should be placed between the kitchen cabinet & the wall to allow the cabinet drawer to open properly. Cabinet Accessories available in most door styles are fluted decorative fillers, wine racks, plate racks, appliance garages, wood hoods, and double waste pull outs. Easy Assembly: RTA Cabinet Assembly videos are available. The cabinet doors are already hinged to the face frame of the cabinet. These ready to assemble cabinets have a metal snap & lock assembly system, no plastic cams and no particle board. Soft close side mount full extension drawer glides can be added to most door styles if they do not come standard with the soft close drawer glides. RTA Cabinets with dovetail drawers and soft close drawer glides. Shaker White, Mocha Glaze, York Cherry, Bristol Chocolate, Hickory Shaker, West Point Grey & Aspen White come standard with dovetail drawers, and full extension soft close drawer glides. 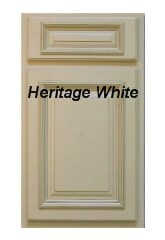 Soft close drawer glides & soft close doors can be added to the Heritage white cabinet for an additional charge. Cabinet accessories available are Wine racks, plate racks, appliance garages, wood range hoods, spice drawers, and decorative glass wall stackers. are available for these RTA kitchen cabinets. The cabinet doors are already hinged to the face frame of the cabinet. Easy to assemble. These ready to assemble kitchen cabinets have a metal snap & lock assembly system, no plastic cams in these rta kitchen cabinets. Are the RTA Kitchen Cabinets easy to assemble? The only tools needed to assemble our rta kitchen cabinets is a screwdriver and rubber mallet. When we assemble the rta cabinets we use a small bead of glue on each joint. The doors are already hinged to the face frame. Our RTA kitchen cabinets and RTA bathroom vanities are designed to be as easy-to-assemble as possible, so even a novice do-it-yourself homeowner can create the kitchen or bathroom of their dreams.